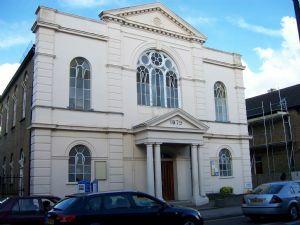 Hounslow Methodist Church is a lively multi-cultural church in the centre of Hounslow. We are passionate about our faith and we try to show it in many different ways. All are welcome in our Church and we look forward to seeing you! Our main service includes a large and lively Sunday School most weeks. Holy Communion monthly on Sundays, both morning and evening, and on the first Thursday of the month at 10am. We hold worship at other times including Sunday evenings and weekdays. Keep an eye on our website for more information. Bible Studies We have a weekly bible study, at Thursday Lunchtimes. Contact us if you want to join them. Supper Talks Regular Friday night talks by Charity speakers. Combined with a home cooked two course meal. All for just £5. Campaigning We are very involved with campaigning on local and global issues at Hounslow. Recently this has included Justice for Bangladeshi Garment Workers and the "Flesh and Blood" campaign for organ donation. We encourage our members to be politically engaged, particularly around election times (as a church we support no specific political party). We are currently engaged with our "In Harmony with Creation" campaign focusing on environmental issues and climate change. Shelter Project Hounslow During the winter months we are involved in the Shelter Project Hounslow, providing (along with other churches in the area) a bed and hot meal to homeless guests. Keep an eye on our website and facebook page for other events!